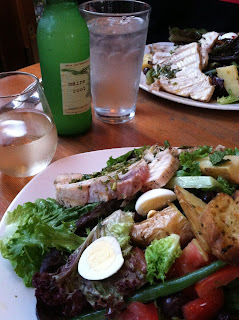 Tender Greens - Tuna Nicoise salad + the spiciest ginger brew I've ever tasted. I could eat this meal at least once per week. Portabella mushrooms, steeped with homemade pesto, baked, then sprinkled with cheese (gorgonzola for me, parmesan for Nate) and broiled. Not much to look at, but divine on the tastebuds. Blooming rose salad from Soleil - Westwood. Simple, fresh, delightful - and absolutely huge. I was stuffed before my entree arrived. 2 shots, 3 ice cubes, a splash of milk. Apple Pan - Westwood. Pecan pie and homemade whipped cream + a side of buttermilk. "Crazy water" - base for acqua pazza. A recipe we just tried this weekend, and which will become a staple. I've long said I don't feel I've had dessert unless it contains chocolate. It's kind of a rule of mine. Now, before you talk to me about pies, you must know by now that I'll eat them for breakfast just as easily as after dinner. So that hardly counts as dessert. Last week, though, things changed. Inspired by a partially scooped tub of mascarpone still in the fridge from dinner (see this recipe for mint-walnut-gorgonzola pesto), I crafted what may be my new favorite dessert. It's simpler than pie, and rich enough that it left me satiated. Best of all, it's malleable to your tastes and the season. Gather some fruit (in this case, I used a frozen berry medley of blueberries, raspberries, and cherries - set them in the fridge for about an hour to thaw slightly but still retain their shape). Sprinkle with grated orange zest. Add the fruit to the martini glass, about 2/3 full. Sweeten some mascarpone (for each serving, softly fold 2 Tbsp of the mascarpone with 1 tsp powdered sugar. For a subtle kick, I also stirred in 1 tsp Grand Marnier. This helped loosen the texture a bit). Dollop the mascarpone atop the fruit. As I said, this recipe seems easy enough to adapt on a whim - try Kahlua or cognac or Tuaca in the mascarpone. Scoop it over fresh strawberries, peaches - maybe even nutty granola? The possibilities seem endless. If you come over to my house for dinner this summer, expect this for dessert. BYOC (bring your own chocolate) - if you must! I’ve been in a creative slump. Since moving to SoCal, many of my former magazine subscriptions have now lapsed – including one I accidentally let slide away (Sunset, don’t worry: you’ll be back on my doorstep next month). 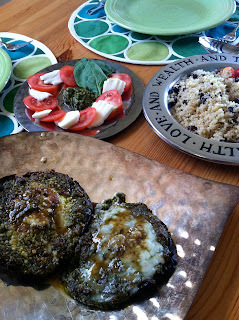 And while I love my cookbooks (I wrote an entire post devoted to them), I also long to try fresh tastes and trends. And yet I’ve found myself relying on old standby’s and Trader Joe’s’ freezer section to get us through spring. I was feeling flummoxed – somewhat despondent, even (I really hate that word. It feels so Sylvia Plath. And yet, it is spot-on.). Everything I prepared was beginning to taste stale and the same. And I was bo-red! And then I met my muse. Oh, Pinterest. You are a soul-saver. Pinterest is like my own personal magazine – chock full of exactly the sections I want to read. Since meeting her, I’ve found loads of new recipes, DIY crafting projects, and countless must-have items for my closet. Oh, and a lot of pink-hair ideas. Summer corn cakes – This is a spot-on recipe, bursting with summer flavors. The only thing I changed is making the cakes a bit larger than recommended. 4-ingredient chicken – Pretty tasty. I used boneless thighs and baked for 25 minutes. Next time I might add some fresh ginger to amp it up. Pomegranate and quinoa “super food” salad – I love that this girl’s from Iowa, just like my mom! This salad is texturally and tastily pleasing. Next time, I’ll buy some fresh shrimp and bake them like this as a topper. Raw basil-dressed vegan salad – Yum, yum, yum! Even though I didn’t use the avocado (not ripe enough), this turned out great. A wonderful base recipe – something to turn to when I have a fridge full of half-used produce. Red lentil coconut soup – A perfect balance of spicy and sweet. Handpies – As I wrote earlier this month, I wanted these to be jammier, sweeter. But the basic concept is perfect, and I’ll be trying different combinations of these all summer. In fact, the softening apples on the counter may just make their way into a cheddar-apple version tonight…. Gingerbread waffles – ahMAZing. Next time I may whip some orange butter together for an extra nod toward the Jitterbug Café in Wallingford (RIP), but these are fab just on their own. Looking back on this list, I think it would make a mighty fine menu for an outdoor summer soiree. Add a Jack & Diane to wash it down, and you’re good! What about you? What are your favorite pins? And while we’re at it, what’s your Pinterest handle? You can find me @amydishes, of course! Since moving to SoCal 6 months ago, I've been thinking a lot about what defines California style. This applies both to fashion as well as cooking. So much of my Seattle wardrobe doesn't make sense here, not just because it's too hot but also because it's too fussy. No one wears high-heeled boots or even strapped wedges to the beach except for in fashion shoots. Forget about constructed dresses and hairspray. None of these are practical in an outdoor lifestyle consumed by the beach and warm sun. When we first arrived, I consistently found myself overdressed at events. It's usually best to be a little dressier, but I felt over-done. I've since traded most of my heels for flats and sandals, stopped blow drying and coloring my hair, and stashed away the more tailored pieces of my wardrobe. Instead, my favorite well-worn jeans plus a light tee have become the staple. Maybe a scarf or some jewelry for an accent, but that's about it. The same goes for cooking. I'd struggled to find my style here in the SoCal kitchen. In Seattle, the home chef reigns as the skies rain, sending us deep into cookbooks and the bowels of quirky markets looking for super ingredients to delight and even one-up our foodie friends. Here, that's just too much. There's no need for a cabinet full of high tech gadgets and fussy ingredients. In fact, I hardly even cook anymore - it's too warm and too enjoyable to spend excess time in the kitchen (and too crazy at the grocery store to take any more time than needed to get the staples). Plus the ingredients are so fresh, it's nice to simply prepare them to let them shine, cleanly. Our focus has changed. We eat well - but we and eat and move on. No more fuss. Case in point are the fresh strawberry hand-pies I made Sunday night, after gaining inspiration from Pinterest. These represent everything about California style - they're casual, flirty, and impossibly simple. They feature fresh, limited ingredients, don't take much time to prepare, and are a light treat. These could easily be adapted to feature whatever filling suits your fancy - I'm thinking peaches in the summer, apples in fall, and even lemon curd into winter. Be flexible and fun with your ingredients - just don't be fussy. PS: This post and pies made to Father John Misty's new album, Fear Fun, as is most everything I do these days. It perfectly captures Los Angeles living (J. Tillman, formerly of Fleet Foxes and Seattle, is also now an LA resident). I think he likes it here, too: "How was I to know that milk and honey flowed just a couple states below?" During a recent visit, my mom politely reminded me that I haven't posted here in nearly two months... It's not that I haven't wanted to write. It's just that I haven't had much to share. In the 3 months that we've lived in LA, I can count on two hands how many times I've turned on the oven to create a proper meal. LA is the land of salads and fast stove top sautes. 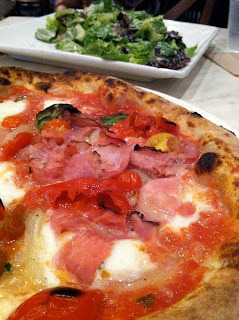 Plus, we've been adjusting to our new schedule (including my husband's crazy commute), which means quick meals - sometimes even impromptu trips to grab a bite out, even on a weeknight - are in order. This weekend, I did make these awesome veggie burgers - which took nearly 2 hours, but were delicious (and made extras, so now we have half a dozen stashed in the freezer for future). I'm also not quite sure where I am with meat vs. vegetarianism. Oh yeah, that old debate. It's resurrected! All told, I haven't felt there's that much worthy of sharing - but at least now I have an entry in my time-log for 2012! More soon, I hope - including the continued quest for that Glenwood Tomato Soup. My current question: Is it Velveeta?